Allspars have extensive experience of Dehler yachts and can undertake any rigging requirement. Jon Pegg was Technical Manager for Dehler UK for some years. Mark Savage has extensive experience of yacht work from replacing halyard tracks and floor or headlinging work to keel removal, repair and refitting. Jarrod and Tony Hulett have been used by Dehler UK for commissioning of Dehler yachts. They offer a wide range of services including: Rigging, Polishing, Antifouling, Anode changes, Winch servicing and Gel repairs.For the racing enthusiasts we also offer hull fairing and rig tuning. GRP repairs Julian Willmott did some cosmetic repair work to the bow of Spirit of Peponi some years ago - the end result was excellent and it is still impossible to see where the repair was made. Dolphin Sails are supporters of our site and a number of Dehler owners have highly recommended their sails and high level of customer care. Dolphin Sails are pleased to offer a 5% discount off their usual prices for all orders placed through the Dehler Owners site. If you would like a quote with the discount please email me. Sail covers and sprayhoods etc. Coastal Covers at Haslar, Gosport are sail makers/repairers and marine cover makers. They offer a winter layup servicing programme and can undertake any modifications or new construction. They are keen to develop business for Dehler items. Prices are competitive and they have already supplied items for a number of Dehler yachts. Original Dehler sail covers - we are able to obtain the original Dehler Sail covers with the Dehler Logo at a competitive price. email if you would like a quote. 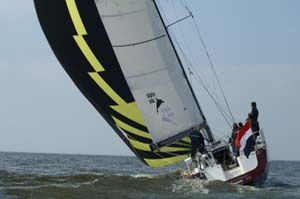 I have excellent service and quality sails from Peter Sanders of Sanders Sails Lymington. He has recently made a new Main (not fully battened) racing sail in Cruiser lam material, 98% cruiser lam vertical battened Genoa, Spinnaker, Code zero Geneker. All the sails were made to optimise the IRC rating. IRC has come out at 0.948 for 2006. Not the cheapest but attention to my requirements and advice to achieve maximum performance with least penalty!